Thank your lucky stars you found her? This set is the perfect gift! 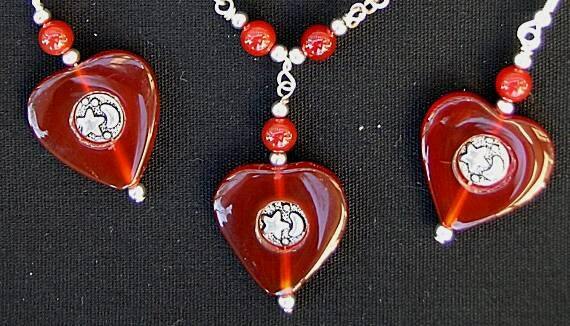 Carnelian Heart Frames have a silver-tone flat star and moon bead inside. The elements are separated with 2.5mm spacer beads. The necklace has a handmade figure "8" chain with 4mm carnelian beads and the star and moon bead links. It closes with a handmade hook and eye. 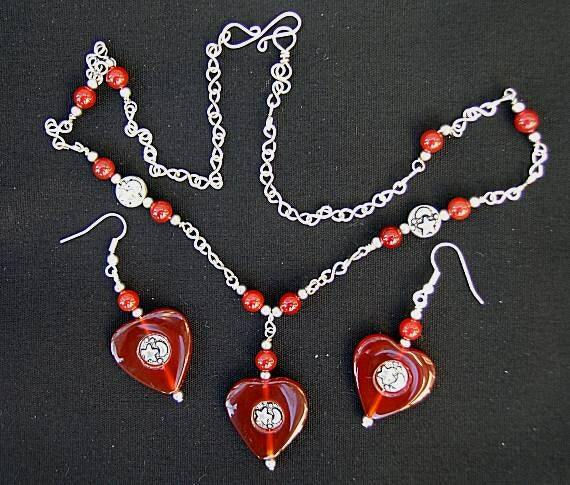 The earrings have the same carnelian heart frame and star/moon bead with a 4mm carnelian bead attached to the ear wires. The heart measures approx. 25mm or 7/8 inch. The pendant is approx. 1 1/2 inches long from the ear wire loop. The chain is approx. 20 inches.